Nearly all clustering approaches use a concept of distance. Data points can be conceptualized in a dimensional space where we can compute a distance measure between each pair of points. Points that are closer together get placed in groups or "cluster" together. The input for the hcluster method in R is a distance matrix, so we'll have to compute one of those somehow. Its a fairly simple scripting job... Now that I have a MATRIX, I load that into R as a dataset. In this example, there isn't an easy, intuitive explanation for the groupings, but for other examples, the groups might make more sense. There are lots of options for computing the clustering, and they may give very different results, so proceed with caution, but in general hierarchical clustering can be a useful tool for lots of data analysis situations. If there are any changes that I can make to SNPduo to make getting this output from the SNPduo R code easier let me know. Oh, and the annoying quotes are defaults in the "write.table" that really tick me off. If you do "write.table(..., quote=FALSE)" you won't get the quoted values. 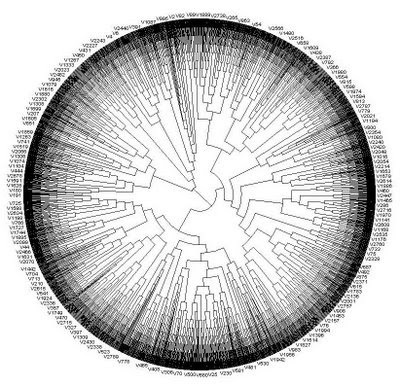 The ape package from cran is capable of plotting circular cladograms. It can convert hclust objects to it's own phylo object, or read a newick string. Hi ulver -- I'm a bit confused with what you mean by "centroid". The easiest way to retrieve elements for a sub-tree is to use Dendroscope to select the sub-tree and it will list the elements for you. Thanks so much for the post! I'm a corpus linguist trying to visualize patterns in language usages and found the described method extremely helpful. 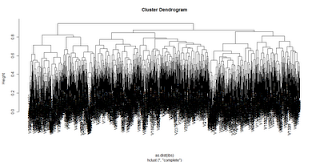 What does the meaning of hierarchical clustering? Can you give me more explanation about it? I really don’t understand about it. Does it have an effect to physiological condition or another? You can explain it through simple examples and ways. Thank for sharing. Hello! I'm a bit confused. I'm assuming your "ibs" variable is equivalent to the "PI_HAT" variable that PLINK can compute. If that's so, shouldn't it be HC <- hclust(1 - as.dist(ibs)) instead of HC <- hclust(1 - as.dist(ibs))? Otherwise we would be feeding a similarity matrix to hclust when we want to feed it a dissimilarity one. Maybe I missed something?